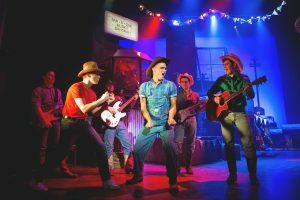 NOSTALGIC songs and energetic dance routines will be the order of the day when worldwide hit show Footloose: The Musical toe taps its way back to Woking’s New Victoria Theatre – with Pop Idol star Gareth Gates as Willard. Based on the 1980’s blockbuster movie, starring Kevin Bacon, the stage production tells the story of city boy Ren, who has to move to a rural backwater town in America where dancing is banned. All hell breaks out as Ren lets loose and soon has the whole town up on its feet. Fans will be yearning to hear songs like Holding Out For a Hero, Almost Paradise, Let’s Hear It For The Boy as well as the title track. When the film was released in ’80s, it quickly became a massive box office success, and the sound-track album ended the year-long reign of Michael Jackson’s Thriller at No1 – eventually selling more than 17 million copies across the globe. Footloose: The Musical opened on Broadway in 1998, followed by the West End in 2006. This latest touring production sees former Pop Idol runner-up Gareth Gates take centre stage. The 31-year-old rose to fame after the inaugural series of the TV talent show in 2001, going on to sell over five million records worldwide. More recently the Bradford born lad has become a stage star with roles in Les Misérables, Legally Blonde and Joseph and the Amazing Technicolor Dreamcoat. The Footloose cast also features Luke Baker as Ren, Maureen Nolan as Vi Moore, Hannah Price as Ariel Moore, and Nigel Lister as Reverend Shaw Moore. Footloose: The Musical will be at the New Victoria Theatre, Woking, from Monday 18 July until Saturday 23 July.